Whether you are going through a job loss or divorce, this practice of fixing broken things may help heal what's broken in you. 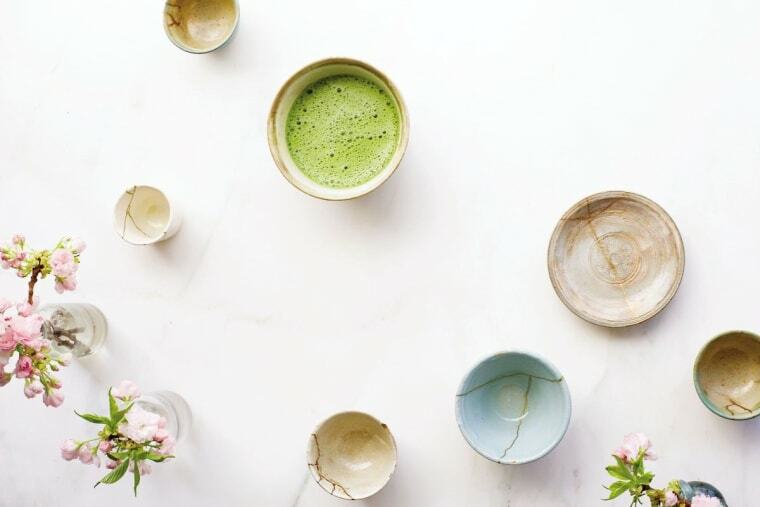 Candice Kumai is best known for her clean green smoothies, matcha confections and healthy comfort foods. But in her new book, Kintsugi Wellness: The Japanese Art of Nourishing Mind, Body, and Spirit, the classically trained chef takes us on a different journey to healing and health by exploring the powerful message behind Kintsugi. You're likely wondering, what is Kintsugi? Kintsugi is the Japanese art of putting broken pottery pieces back together with gold — built on the idea that in embracing flaws and imperfections, you can create an even stronger, more beautiful piece of art. Every break is unique and instead of repairing an item like new, the 400-year-old technique actually highlights the "scars" as a part of the design. Using this as a metaphor for healing ourselves teaches us an important lesson: Sometimes in the process of repairing things that have broken, we actually create something more unique, beautiful and resilient. Kumai, who is half Japanese, first learned about Kintsugi as a child from her mother and grandmother, but it wasn't until recently that she rediscovered it's relevance. “Kintsugi was something I had learned at a very young age, but it was brought back to me when I was going through a really hard time in my life,” Kumai says. That’s when Kumai decided to make a trip to Japan and study under a Kintsugi master in Kyoto. “It occurred to me that people needed metaphors and objects to understand the art of healing. Kintsugi reveals how to heal and shows you that you are better with your golden cracks,” Kumai says. During the three years it took Kumai to write, edit and shoot photos for the book, she visited Japan 10 times, learning just how relevant the message of Kintsugi is to our everyday lives. Whether you’re going through the loss of a loved one or a job, or are recovering from an injury, divorce or other personal tragedy, Kintsugi can be a way to reframe hardships to remind yourself that you’re not a victim of your circumstances — and to help you come out the other side stronger. Kintsugi is the Japanese art of putting broken pottery pieces back together with gold — a metaphor for embracing your flaws and imperfections. “You won’t realize your full potential until you go through the tough times,” Kumai says. With that said, Kintsugi takes work and awareness in order for it to truly be healing. That work, Kumai says, starts with following the main principles she outlines in her book. Here, Kumai gives us a taste of how you can apply some of these Kintsugi practices to your everyday life. Gaman is the ability to endure, be patient and remain calm. Everyone can practice gaman in everyday life by meditating, through visualization or by taking a few moments to just breathe. Christine Tolman, LPC, says, “By focusing on something as simple and vital as breathing, we are giving our minds a break. Resiliency can be practiced every day in how you respond to daily stresses.” Instead of focusing on negative circumstances, Kumai says you can use challenges as an opportunity to learn. Whether you’re going through something as serious and life-changing as a divorce or are trying to get through a stressful work week, gaman encourages us to tap into our inner strength and focus on our potential. “If one can practice strength from within, that is more powerful than anything negative,” Kumai says. When I was in Japan, I learned how the devotional monks ate simply and very clean. They live with very little; it taught me that we don’t need a lot to take care of ourselves.